Janice Huff's forecast for Saturday, May 13. 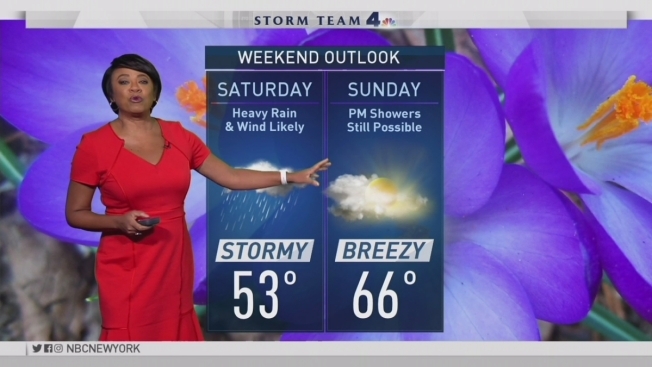 A powerful spring storm is expected to punish the tri-state area with heavy rain and strong winds this weekend, turning Saturday into a complete washout and Mother's Day into an unfortunate mess. Storm Team 4 says clouds thickened and winds picked up Friday as the storm approached. Showers are expected to move in between 3 a.m. and 7 a.m. Conditions will progressively deteriorate over the course of the day Saturday, bringing periods of heavy rain, gusty winds and possible coastal flooding into the evening, Storm Team 4 says. Mother's Day isn't forecast to be quite as nasty, Storm Team 4 says, but lingering showers are likely. By the end of the weekend, the city and coastal areas could see at least 2 inches of rain or more. While the weather system is expected to be intense, it likely won't cause the severe flash flooding that buried cars and streets under water across a wide swath of the tri-state area last week, Storm Team 4 says. The weather improves early next week, with temperatures reaching the high 60s Monday, moving into the 70s by Tuesday and hitting 80 by Thursday.